You could say that Shannon and Tom’s love was built on strength, as the couple met when they were powerlifting at the same gym and quickly developed a solid friendship. Although he kept it to himself, Tom was quietly falling in love with Shannon every time they met up to lift weights together. 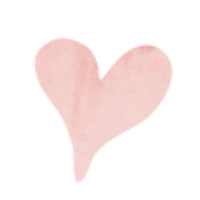 But, Shannon wasn’t available so he thought that his feelings would remain forever unrequited. Eventually, though, it became clear that nothing would stand in the way of their destiny to be together. To Tom’s delight, Shannon’s situation changed and she was finally free to tell him that she shared his belief that they should be more than friends. Shannon and Tom are partners inside and out of the gym. They spot each other when things get tough, and they are one another’s source of strength and support every step of the way. Without a doubt, Shannon and Tom have got each other’s backs for eternity. 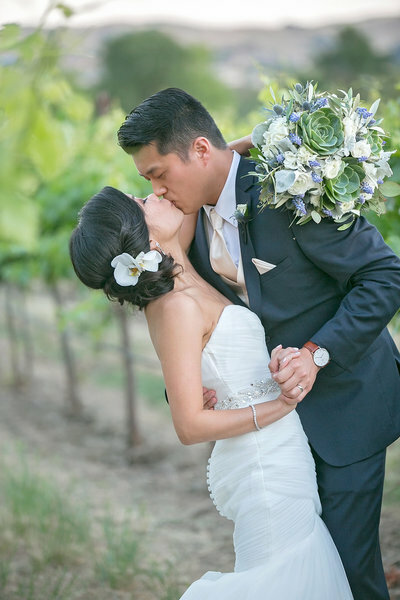 The couple’s outdoor ceremony was held in the rustic grounds of Picchetti Winery in Cupertino, California. Their day was all about the details: from Shannon’s custom shoes and Tom’s custom socks to heirloom jewelry and beautiful hairpieces. During their intimate vows, the wedding party basked in late-afternoon sunshine as Shannon and Tom proudly declared their love for one another. The bride carried an elegant bouquet by B & B Floral Design in Sunnyvale, which perfectly complimented her stunning lace gown from Essense of Australia. After Shannon and Tom said “I do” the wedding party headed inside the winery for a decadent dinner and of course, lots and lots of wine. Romantic lanterns and white and lilac flowers filled the room, and the couple’s good humor and love of sweet treats was evident at every turn. Their ‘cake’ was almost entirely made up of delicious donuts from The Sweetbox Bakery in San Jose, and even the traditional top tier of the cake, made by Susie Cakes in Willow Glen, was adorned with donut-themed bride and groom toppers. As the sun set, the couple’s 120 guests partied to music played by DJ Cyrus from DJ Jeremy Productions in San Francisco, pausing only to enjoy the bouquet-toss and a donut or two. When Shannon and Tom’s guests think back to their April wedding, what they’re sure to remember most is how much fun they had and just how strongly the couple’s love for one another shone. And, as a perfect ending to this tale of love and happiness, Shannon and Tom are expecting twins this year! Congratulations! Get in touch to discuss my wedding photography packages in San Francisco, Napa, the Bay Area, Carmel, Sonoma, and the surrounding area. The Copyright Act protects photographers, giving them the exclusive right to reproduce their photographs. This includes the right to control the making of copies. It is illegal to reproduce the images without my permission and violators of the Federal Law are subject to criminal penalties. If you purchase digital images from your session, you are purchasing limited rights to reproduce the photos and a print release will be provided allowing you to order prints/products for personal use only from the lab of your choice. Please note that it is illegal to scan prints, right-click or screen shot online proofs or other online images featured on the web site or the blog, make copies from prints, sell or alter images received in digital or print format. You may post images on Facebook or other social media if the pictures are clearly labeled and linked to Portraits of Grace Photography. Please do not edit or ad any filters to your images.  In all cases, Portraits of Grace Photography retains full rights to the images produced and reserves the right to use the images for display, publication or other purposes. Prices and policies are subject to change at any time. Within 2-3 weeks of your session, your portraits will be available for viewing. We are a boutique photography experience and offer in person printed proofing of your session. Should you decide to order at the in person proofing, you will be offered a substantial discount at that time. If you need other arrangements, please let us know. We make every effort to post a “sneak peek” of a few images within a day or two on Facebook. Please note that due to differences in computer monitors, the colors may not appear the same on your monitor as they will when printed. This is why we offer an in person PRINTED proofing experience. The artist selects the images to be included in the gallery. Images are selected and edited at the Photographers’ discretion and we reserve the right to edit and release only those deemed creditable as professional in quality and within the Photographers’ artistic standards. If a high res images are purchased by the client, the boutique flash drive includes only the images included in the client gallery. In other words, we do not edit every photo taken at your session. 100% of the purchase price is due at the time you place your print or product order. This payment is non-refundable because the items being ordered are custom items. Prints may take up to 2 weeks to arrive after they are ordered. Payment plans are available for “collection” purchases meeting certain criteria. Print prices and policies advertised at the time of your session are good for up to 30 days following your session. After 30 days following your session, orders are subject to current pricing and policies. Client files and photos will be archived after 30 days following your session and orders (or reorders) placed after that time will be subject to a small reprocessing fee. Photo labs use different equipment, photo paper, color profiles and the quality of labs varies greatly, we cannot guarantee the quality of prints not ordered through our professional lab. 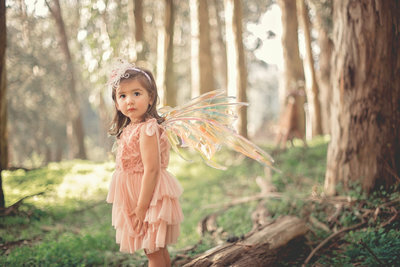 Offering boutique, on location photography in and around the San Francisco Bay/Central Valley Area & Western New York. Specializing in Children, Families, Couples, & Weddings. We LOVE to travel and will consider weddings worldwide....just ask!